Die vielen berühmten Burgen und Festungen von Siebenbürgen abzuhaken, kann schwierig sein. 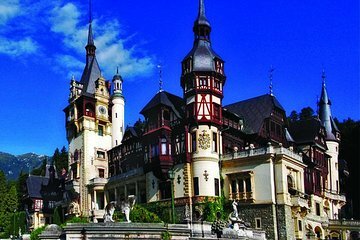 Erkunden Sie an einem Tag 3 ikonische Burgen auf einer ganztägigen Tour ab Brașov und fahren Sie bequem mit einem Luxus-Minivan zwischen verschiedenen Orten. Profitieren Sie von der Größe der Kleingruppentour für ein persönlicheres Erlebnis und erhalten Sie einen Einblick in die Geschichte und Kultur der Region von Ihrem Reiseführer. Entspannen Sie sich nach einem Sightseeing-Tag mit einem Hin- und Rücktransfer von Ihrem Hotel in Brașov. This tour was terrible! You get a driver not a guide and its just a frustrating day! Fist of all they should just get everyone to meet in the main square, its frustrating to start the day driving around neighbourhoods picking people up. This is a pointless offering which sets a bad tone to the day. The driver was angry with the traffic and it made us all feel really awkward. The driver didn't introduce himself or ask us to introduce ourselves, it was such a terrible start to the day. Secondly they simply must get the driver to ask the tourists if they wish to have food and then book a table at a good restaurant a place showcasing the best of local cuisine and not a tourist trap by the castle. Have the table waiting and perhaps arrange with the restaurant to offer a smaller menu which will be quicker to serve. We were taken last minute to one of the restaurants by the castle, wasted 1 hour and 45 min waiting for and subsequently eating terrible food. Its a travesty that they would take tourists to a terrible place like that in the heart of Transylvania when there is so much fantastic food here. Finally, how difficult would it have been to send a guide and not a driver who didnt engage with us at all, moreover he told us that Rasnov is not very interesting. They should have sent someone who has an interest in local history and could make the places come to life with tales and anecdotes. It would have made a world of difference if we had a guide to explain the history of the places we were driving through and not just a driver who clearly has no enthusiasm for his job or any regard to customer experience. This whole day felt like an unorganised tourist trap. I for one am furious that I have wasted a day and money on this tour it would have been better to book a cab or just hire a car. This was the feeling amongst all of the tourists on this trip. On Viator it says that the tour gets back at 4:30 pm this is not accurate as we got back after 7pm. To top it all off, when I messaged the company to complain they started arguing with me engaging in a childish back and forth they said that they contacted the other tourists here is what they wrote back to me They all said that there were 2 people on the bus that kept creating bad atmosphere by complaining all the time and disrespecting everyone else, act like it was their private tour and not a group tour and this way ruininig their day Funny that as we had dinner with one of the others that following night and ran into one of the couples the next day, both said that they have not been contacted and once again spoke of how terrible the day was. Everyone on the bus was disappointed with this tour not just us. Dont waste your money on this and just hire a car and do it yourself or contact a guide. A great way to see 3 castles in one day. Our tour guide, Manu, was invaluable and I would highly recommend her. She was knowledgeable, patient, accomodating and an excellent driver. She made our tour extra special. Totally worth every penny. Our guide Manuela was friendly, fun and super knowledgable of all the sites we visited. Manuela made this tour for us, I can not believe there is anyone more knowledgable about Romania and its colourful history than her. We wanted to do these sites independently however short on time we chose this tour, we are so glad we did, we would have missed out so much and spent so much time queuing and driving I don't think we would have covered so much in a day. Peles is stunning, Bran's history fascinating and Rasnov views beautiful. Manuela you are a star. A wonderful trip with a fabulous and highly knowledgeable guide. Wonderful day - our guide was funny and helpful and found ways to navigate through the crowds, especially at Bran Castle. Would recommend!